Shri. Bhaskar Katamneni , I.A.S, Collector & District Magistrate is an officer of the Indian Administrative Service (IAS) belonging to the batch of 2004. He did his M.A, GEOGRAPHY in Jawaharlal Nehru Vishvavidyalaya (1998 – 2000) and a M.Phil, Geography in Jawaharlal Nehru Vishvavidyalaya (2000 – 2004). 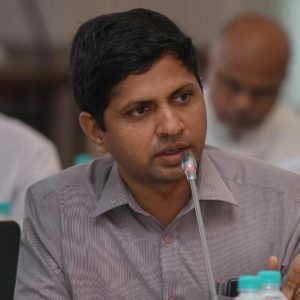 He had held several charges like Zonal Commissioner-Greater Hyderabad Municipal Corporation and also worked as Joint Executive Officer(Tirumala Tirupati Devasthanam) and Project Director – Andhra Pradesh Municipal Development Project before becoming the Collector & District Magistrate, West Godavari.